Grains are a controversial food in modern society, but the real problem with grains may not be what you think! On the one hand, you have experts who claim that we aren’t meant to eat them based on the stance that grains are a modern addition to the food supply and people have consumed them for only the last 10,000 years or so. Others claim that grains are the foundation of our food supply and have been for thousands of years. Turns out that both sides might be, but with some important caveats. This means it isn’t a simple answer, mostly because we may not actually be talking about the same food! Grains are simply the hard, edible seeds of grass-like plants. There are many varieties and the most common are wheat, corn, oats, and rice. They are one of the most-consumed foods worldwide and the primary source of nutrition and energy for many populations around the world. 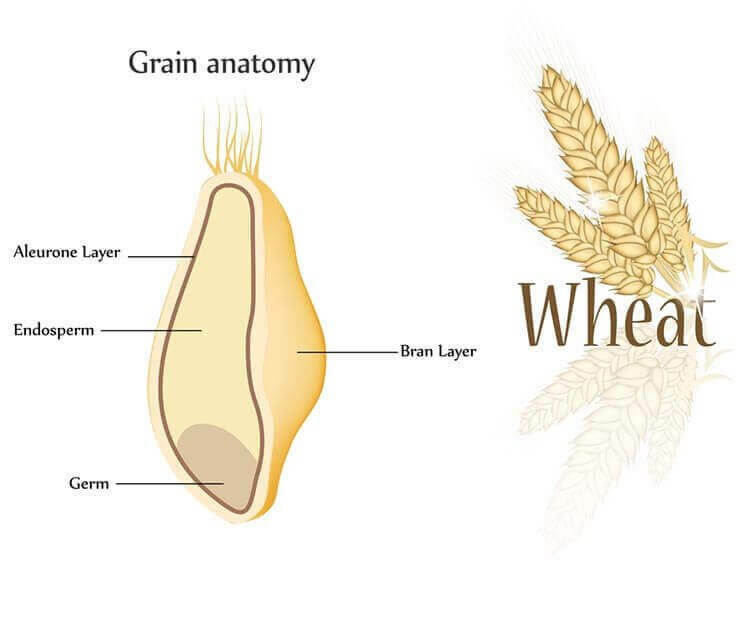 By definition, a “whole grain” contains all parts of the seed, while refined grains often have the bran or germ removed, leaving just the highly starchy endosperm. Whole grains can be a source of nutrients like B-vitamins, magnesium, and others, but in refined grains most of these beneficial parts are removed. Many manufacturers enrich processed grains with synthetic forms of nutrients like folic acid (instead of the natural form of folate), iron, and B-vitamins to try to make up for the nutrients removed during processing. It’s a fact: modern grains aren’t the same as they used to be a few hundred years ago, or even a few decades ago! And the grains we consume in the U.S. aren’t the same as the grains eaten in other countries … especially when it comes to wheat. 1. New ways of processing led to wider availability (and decreased nutrients). With the dawn of the modern mill in the mid 19th century, grain evolved. Before this time, grains and wheat were ground in whole form, often with stones, and the flour still contained all the components of the whole grain. It was now possible to separate the parts of the whole grain and use just the starchy endosperm to create an inexpensive and very finely ground white flour (similar to most flour used today). Without the bran and germ, these new refined flours lasted longer on the shelf but contained much lower levels of nutrients. So much lower, in fact, that in the 1940s manufacturers started to “enrich” wheat and other flours with synthetic nutrients. Along with the reduced cost of flour from the newer and more efficient method of refining, availability of flour soared and almost everyone could now afford it as a regular staple. This, of course, led to more people consuming flour. 2. Agronomists developed new types of wheat to increase yield. In the 1960s agronomists developed new cultivars of wheat in order to increase the amount of wheat possible to grow per acre. This modern wheat is a type of dwarf wheat that, unfortunately, is much less nutritious and comes with a list of potential problems. A centuries-long study has tracked the results of this change. Since 1843, researchers in England have been conducting research called the “Broadbalk Winter Wheat Experiment.” They tracked many variables related to wheat cultivation, including fertilizer use, crop rotation, and nutrient content. Between 1843 and the mid 1960s, the mineral content, including zinc, magnesium, iron, and copper, of harvested wheat grain in the experiment stayed constant. But after that point, zinc, magnesium, iron, and copper concentrations began to decrease – a shift that “coincided with the introduction of semi-dwarf, high-yielding cultivars” into the Broadbalk experiment. Another study found that the “ancient” wheats – emmer, spelt, and einkorn – had higher concentrations of selenium, an extremely important mineral, than modern wheats. Further compounding the mineral issue is the fact that phytic acid content remains unaffected in dwarf wheat. Thus, the phytate:mineral ratio is higher, which will make the already reduced levels of minerals in dwarf wheat even more unavailable to its consumers. In other words, while these modern varieties are easier and faster to grow, they don’t contain the same levels of nutrients but have the same levels of phytic acid, creating an imbalance that can lead to nutrient deficiencies. 3. 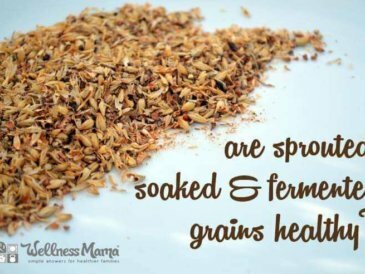 Grains are hard to digest without soaking, sprouting, and other traditional preparations. Aside from the fact that the grains and flours we consume are fundamentally different from the ones our grandparents and great-grandparents consumed, we also prepare them much differently and this may also help explain the increasing rates of allergies and intolerance problems with grains. I explain in depth in this article how in almost all cultures people traditionally prepared grains by different methods like soaking, sprouting and fermenting (think sourdough bread). These methods make the nutrients in grains more available to the human body and reduce the phytates that can bind to minerals in the body. Many studies support the nutritional benefits of this traditional preparation. In the name of convenience, we’ve largely stopped using these traditional preparation methods, further reducing the amount of nutrients we can obtain from grains and flours and potentially increasing the amount of mineral-binding phytic acid we consume. But Why So Many Allergies to Grains and Wheat Especially? If we just look at the changes in grains from the invention of the modern steel mill and the high-yield dwarf varieties cultivated in the 1960s, it still doesn’t completely match up with or explain the drastic rise of grain-related allergies and intolerances in the last two decades … but there is a missing link that might! Are Grains and Wheat Toxic? Other countries don’t seem to have the same problem with grains. Many people report that they are able to eat wheat and other grains without a problem when travelling abroad, even if they react to it in the U.S. In fact, I know several families who while traveling out of the country who consumed more processed grains than they would at home and noticed that certain digestive and skin issues actually improved. I have family members who can consume certain varieties of grains (like imported organic Einkorn wheat or the ancient grain spelt) without a problem but react horribly to regular wheat or grain products. Why is this? Both contain gluten, so perhaps gluten intolerance isn’t the problem we think it is! In fact, the answer may be something much simpler and more obvious that isn’t being widely talked about: the cultivation and spraying methods that have changed in the last few decades. So what’s a mom to do? 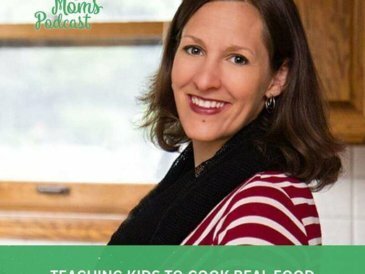 So many experts in the health world today (many that I’ve interviewed myself on the Wellness Mama podcast) say a resounding “no” to grains and especially gluten-containing grains. JJ Virgin recommends against giving wheat or gluten to kids and Dr. David Perlmutter blames grain in large part of the rising epidemic of MS and other brain conditions. I agree with the Healthy Home Economist that new pesticides (Roundup or glyphosate, specifically) are largely to blame. 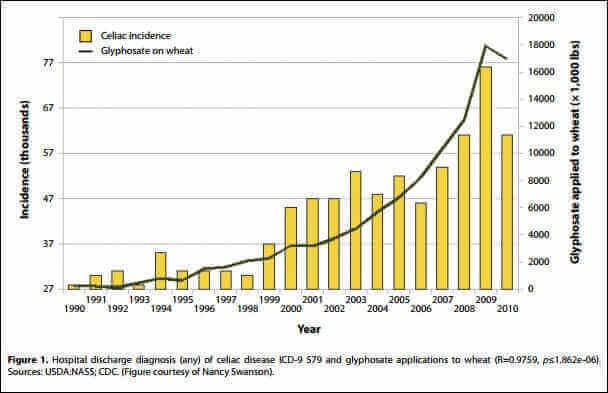 The timeline matches up much more closely with the rise in wheat and gluten intolerance in the U.S.
Pre-harvest application of the herbicide Roundup or other herbicides containing the deadly active ingredient glyphosate to wheat and barley as a desiccant was suggested as early as 1980. It has since become routine over the past 15 years and is used as a drying agent 7-10 days before harvest within the conventional farming community. According to Dr. Stephanie Seneff of MIT who has studied the issue in depth and who I recently saw present on the subject at a nutritional Conference in Indianapolis, desiccating non-organic wheat crops with glyphosate just before harvest came into vogue late in the 1990’s with the result that most of the non-organic wheat in the United States is now contaminated with it. The fact that glyphosate is banned in many parts of the world may explain why other countries fare better. Of course, I’m hesitant to assume that any of these factors alone is directly responsible for the rising problems we are seeing related to grain consumption in the last few decades, but when you consider that glyphosate may impact gut bacteria in a negative way, it makes sense that this could be contributing to the problem. Aside from the above problems with modern grains themselves and the way they are cultivated and processed, I believe there are several other (possibly inadvertent) effects of our grain consumption. We know that statistically we are consuming more grain products in general (both whole grain and refined grains) and that corn and wheat are two of the top 5 most consumed foods in the United States. 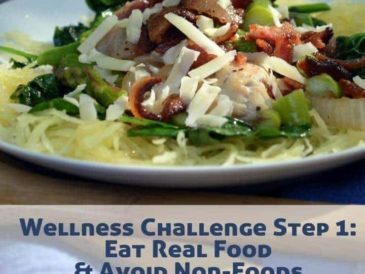 We also know that we are statistically consuming less fat that we have in previous decades, and fewer vegetables. Since refined grains can spike insulin levels and are a highly processed carbohydrate, our increased consumption may be partially to blame for the rising rates of diabetes and obesity (though of course other factors come into play here as well). 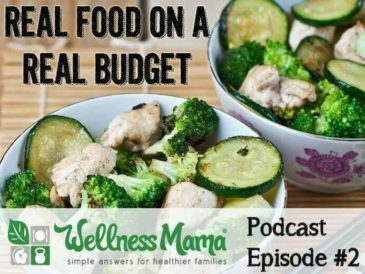 Grains like wheat are found in the vast majority of all processed foods, which makes sense because they are inexpensive, shelf stable, and easy to manufacture. Unfortunately, we are consuming these foods in higher amounts at the expense of foods like vegetables, healthy proteins, and beneficial fats. More grains and less of other foods means that we are also statistically consuming fewer of the nutrients found in foods like fresh produce, ethically sourced proteins and healthy fats. As we already know that modern grains have a diminished nutrient content, it is no wonder that it is becoming so difficult to consume enough nutrients from food alone. Many experts suggest that micronutrient deficiency may be a large contributor to many types of modern disease as we simple aren’t able to obtain enough micronutrients from our food supply. As grains are a large part of the modern food supply but a low source of nutrients, they are contributing to this problem. The problem with grains isn’t as clear-cut as it sometimes seems. It isn’t just about the gluten, or the processing, or the modern cultivation, but a complex combination of many factors. There isn’t a clear-cut answer to that question and it truly does vary on an individual level based on gut health, the type of grain, and how it was prepared. 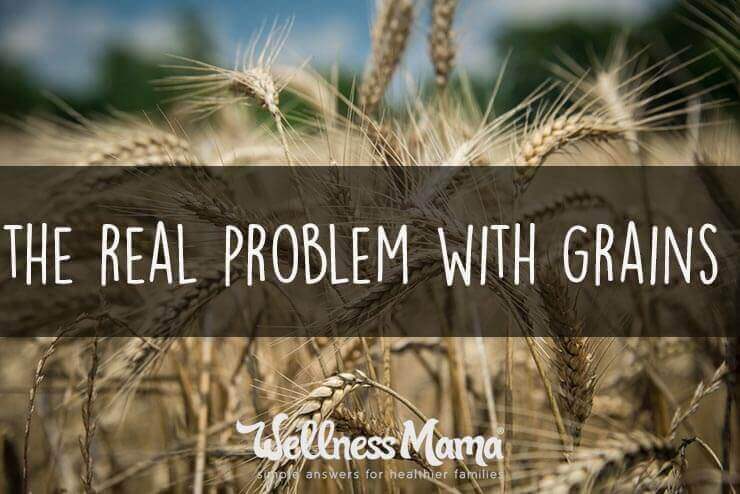 For years, I was completely anti-grain and didn’t eat them at all, especially while healing a thyroid issue. After many years of consuming processed grains when I was younger, I felt great avoiding grains entirely and saw no reason to eat them as I was consuming more nutrients and more vegetables without grains in my diet. This was a guiding principle of my cookbook as well, which I kept entirely grain free and dairy optional. These days, I do eat white rice on occasion (here’s why) and serve it and other organic and properly prepared grains to my family at times. I still avoid most grains, especially those that contain gluten, the majority of the time. If I do consume grains, I opt for white rice or properly prepared whole grains such as organic Einkorn (soaked, fermented, sprouted, etc.). I don’t make grains a staple of my diet. I do occasionally consume them but make sure that the core of our family’s diet is a wide variety of vegetables and fruits, healthy proteins, and beneficial fats. Whenever possible, I use vegetables in place of grains. Love grains or hate them, vegetables typically contain many more nutrients. I make simple substitutes like using cabbage for noodles in spaghetti or sweet potatoes instead of noodles in lasagna. Not only are these substitutes more nutritious, but they also taste better (in my opinion). I often bake with grain-free flours like coconut flour or almond flour, which are higher in protein and fiber and experiment with cassava flour and plantain flour (sources of resistant starch). When I travel internationally, I try grains in other countries out of curiosity to see how I react. So far, so good … the research continues! I realize that for many people completely avoiding grains is neither desirable or practical, and it certainly may not be necessary for everyone. At the same time, I continue to feel strongly about avoiding processed modern grains that have been refined, modified, and highly sprayed as they offer no nutritional value and may have a severe health impact over time. What do you think? Do you consume modern grains? Why or why not? 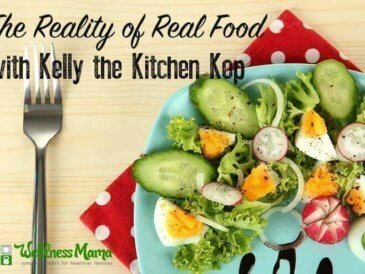 The Importance of Eating "Real Food"
Are Sprouted, Soaked, & Fermented Grains Healthy?